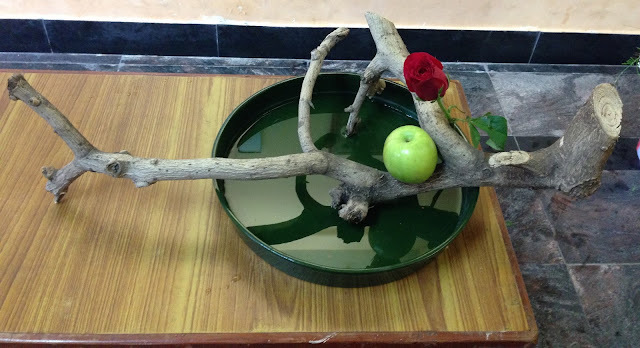 It is Madras Day here in Chennai as our city celebrates its founding. Our Chairperson, Malathi Sensei requested members to honour this meeting as part of the celebrations. 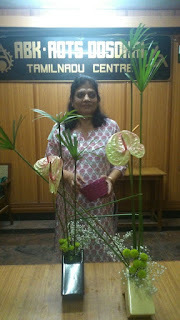 She reminisced how Madras was during 1968 to '73 and how it was between 1976 till today. 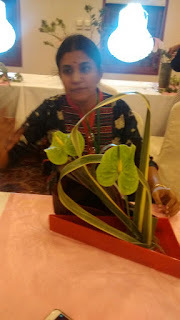 Young girls were in ' half sarees' and salwar kameez was not in fashion! Madras and a single 5 Star hotel called Connemara, and there were no florist shops other than garland sellers. 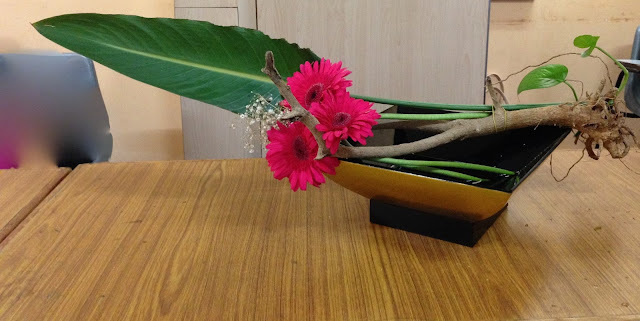 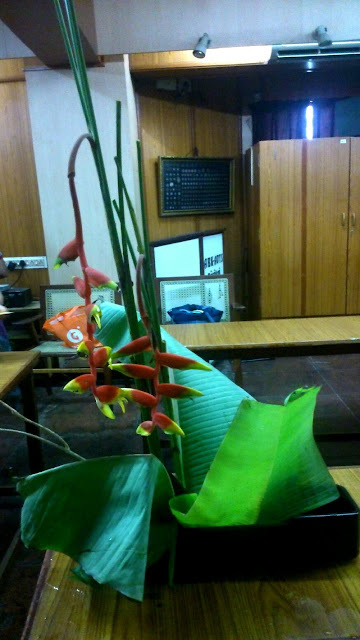 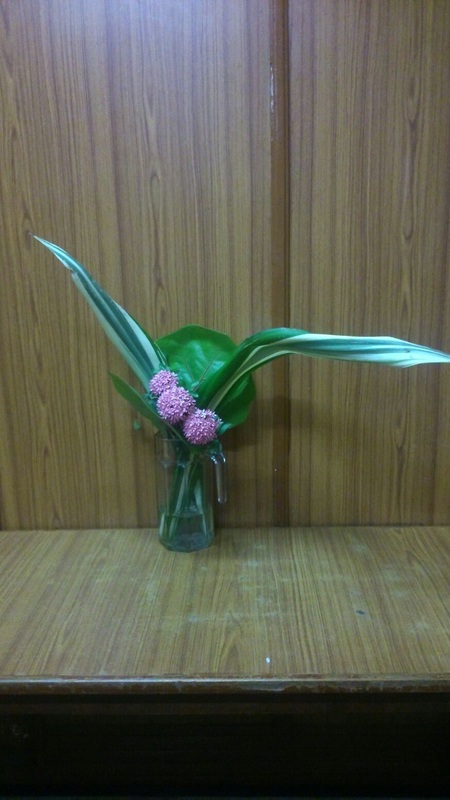 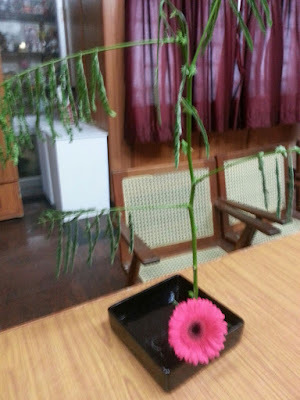 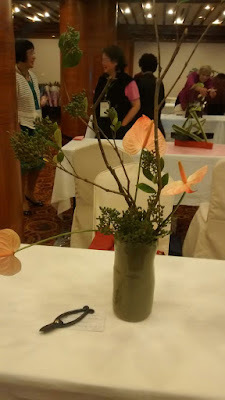 In such a situation she started ikebana lessons,where cut flowers were available only at 'Rosedale' situated in Connemara and an outlet in Dhun Buildings. 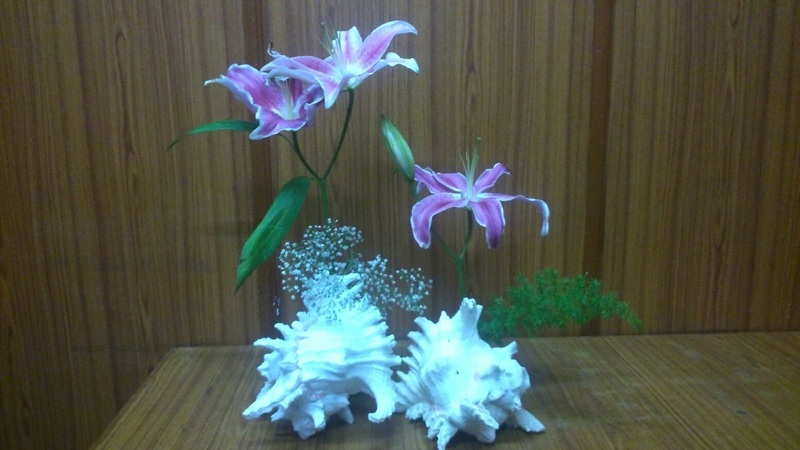 Only few varieties of flowers were available then - Gladiolus, Arum lily, Rose, Asters and Tube rose in season. 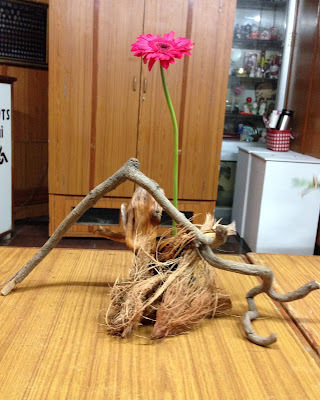 To keep the interest alive among the students was the greatest challenge, with these same materials on and on, and handling ' Lines ' as per the curriculum. 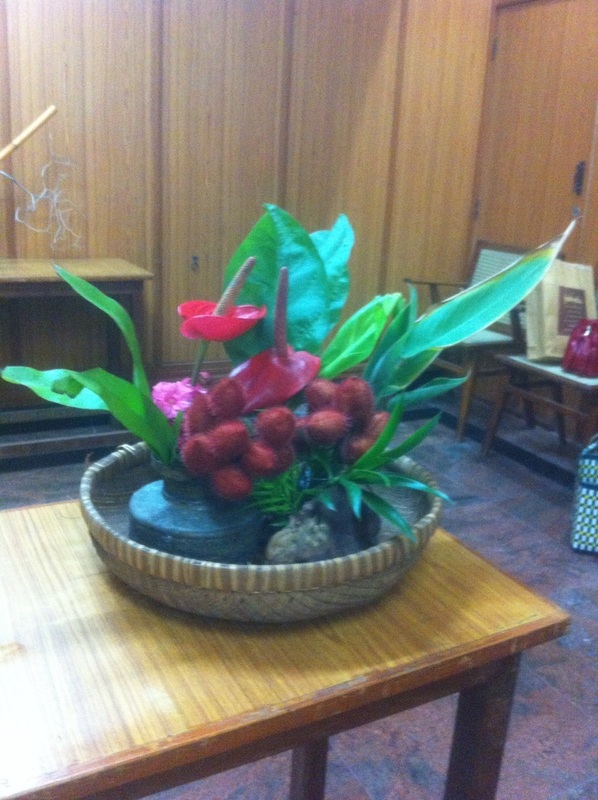 Today the city boasts of florist shops in every neighbourhood and girls sport the latest international fashions! 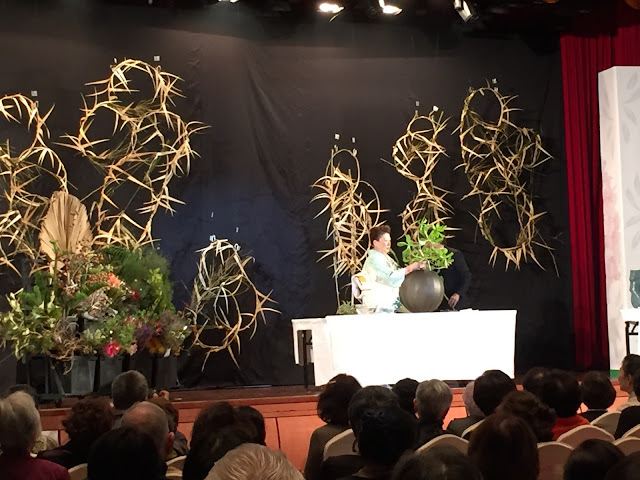 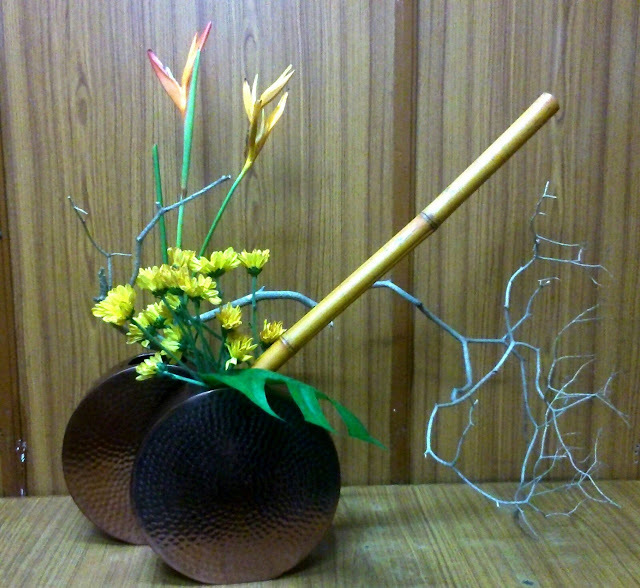 Sogetsu Ikebana too has grown from strength to strength, and we have made the neighbourhoods more colourful and she has no doubt Ikebana in the city will be an established activity. 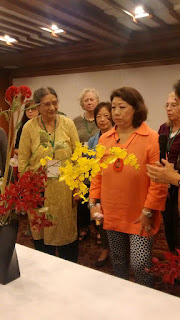 After a brief introduction of two new members - Divya and Chitra - Molly sensei made use of local Madras materials in her demonstration, with the "no kenzan" theme. She began with a lovely ceramic vase, with a beautiful inner surface, and her composition helped to highlight this surface, with the red Gladioli adding colour. 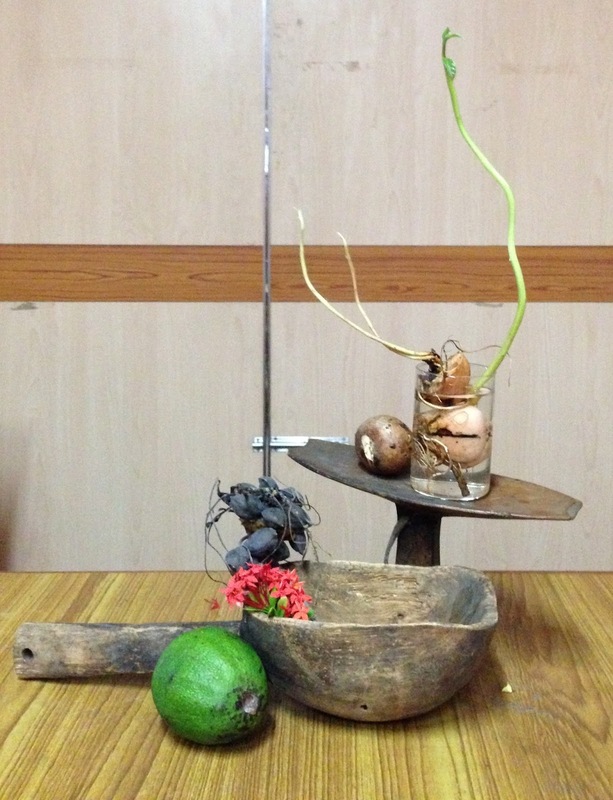 The strong sapota branches intersected one another to achieve balance. 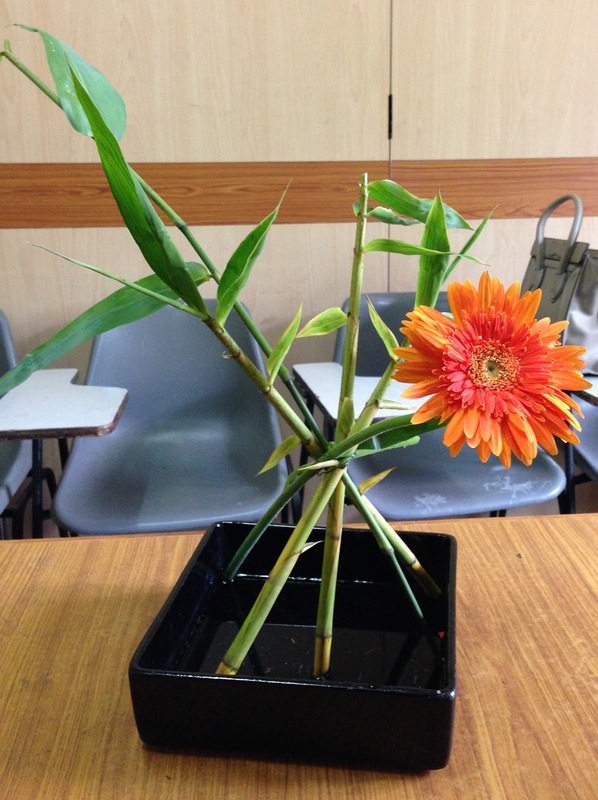 Molly sensei's first composition, demonstrating arranging without a pinholder. 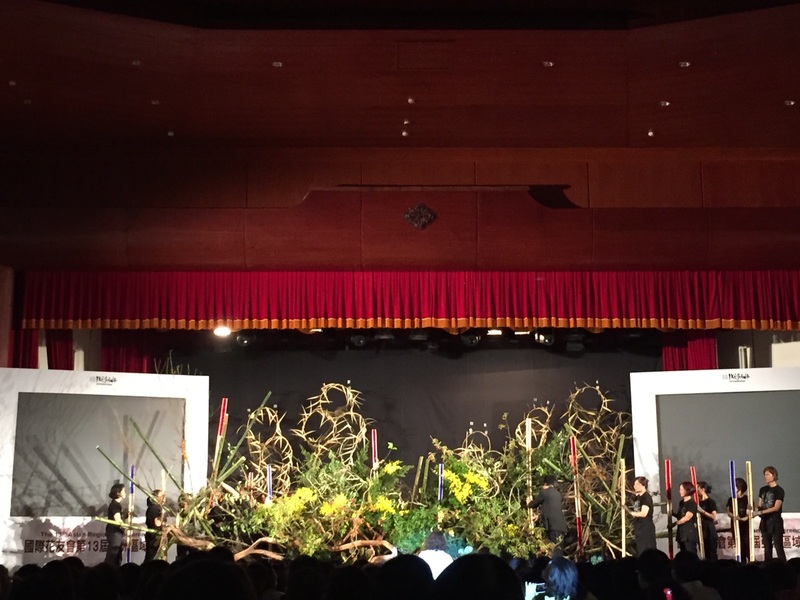 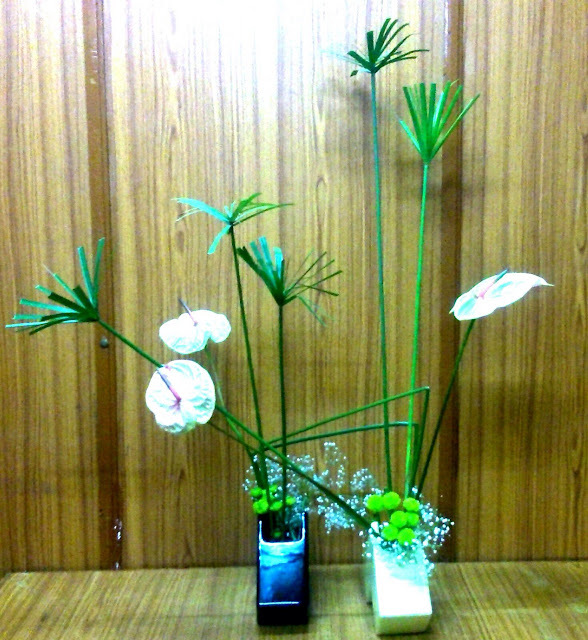 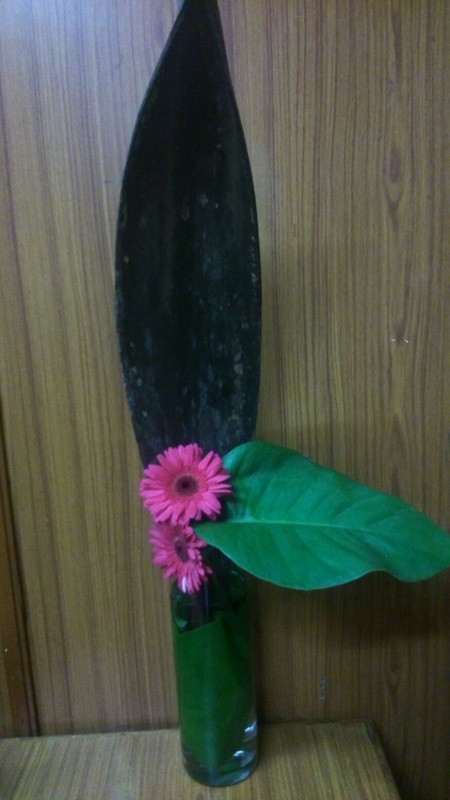 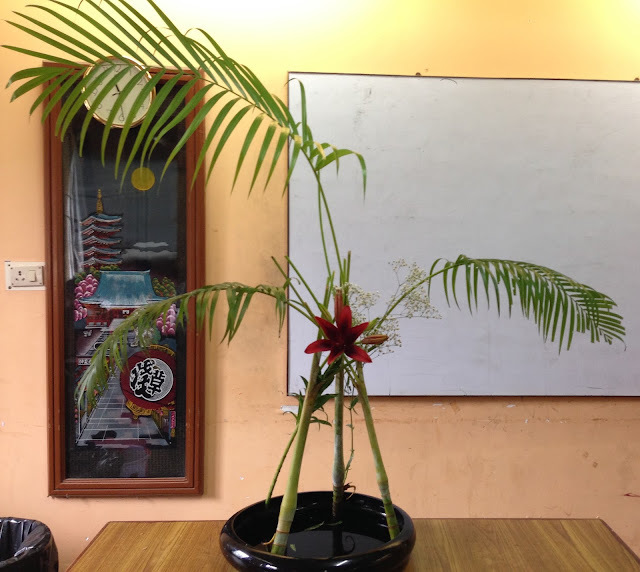 For her second arrangement she chose a wide black moribana container, and used a material that is so typical of our city - palm leaves. 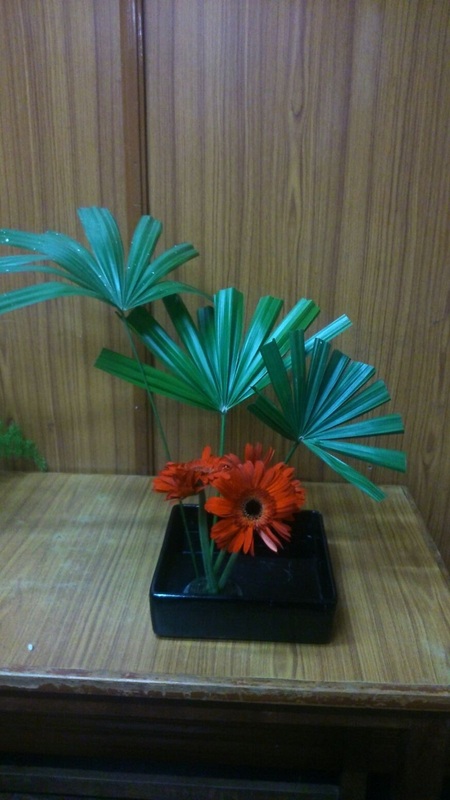 Given the tropical and sultry nature of our city, these palms thrive well and can be seen in many a garden. They are dramatic and make for bold lines, helping to increase the scale of a composition. 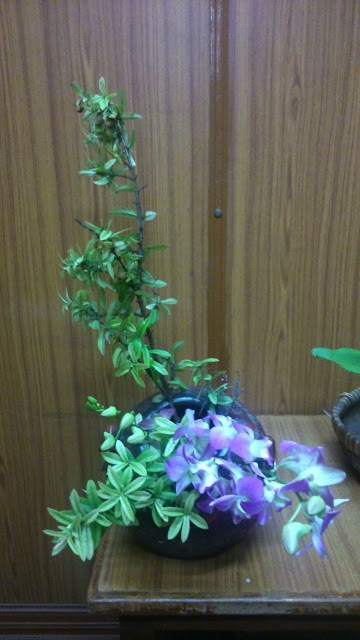 Molly sensei trimmed some of the leaves, so that the stems formed extra lines that added depth to the arrangement. They were wired together to ensure they stayed balanced. 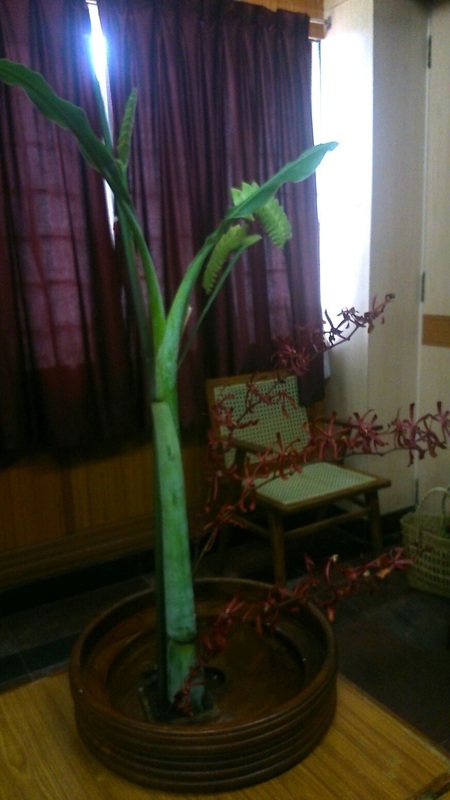 She then used a deep red Asia Lily to add colour and bring a focus to the composition. 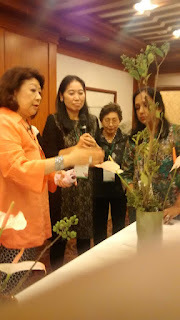 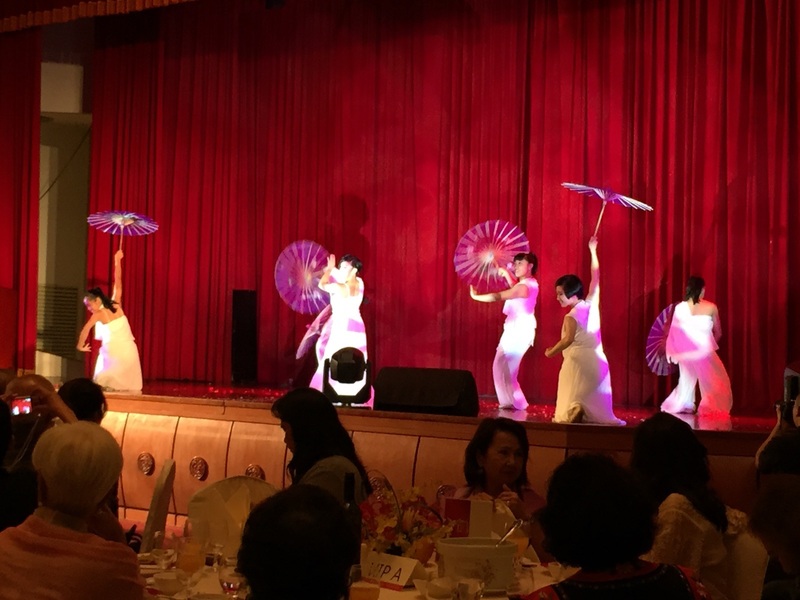 The eleven members then participated in a workshop on the same theme. While many tried slanting style in the no kenzan positions, others used their materials innovatively to maintain balance and achieve focus. 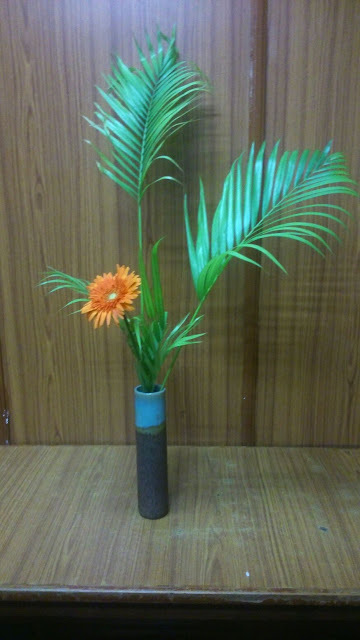 Trishala also displayed the inner surface of her moribana vase, with a bright yellow focus of the jerberas. 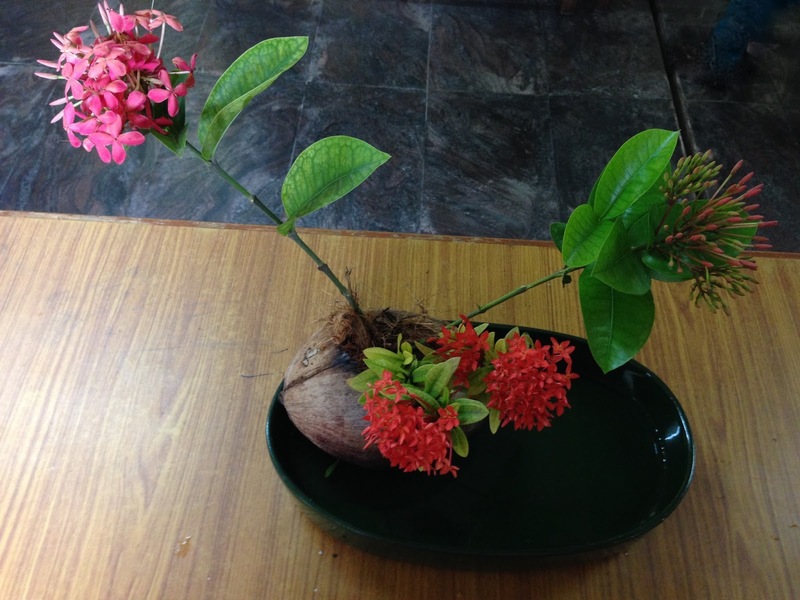 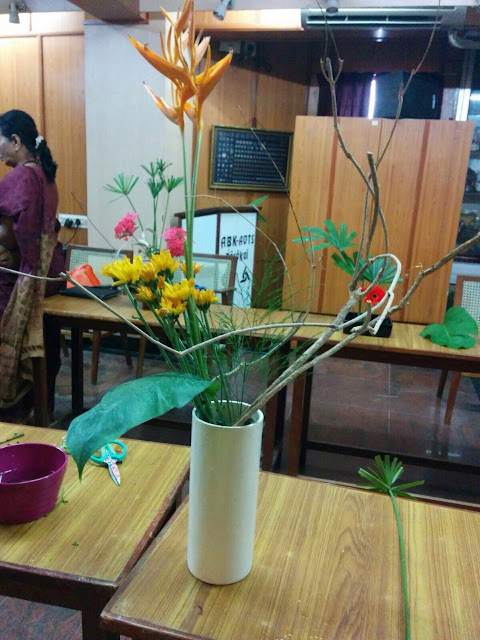 Malathi sensei used materials from her garden - allamanda buds and dressina lines. Prerana worked to develop another"still life" composition, with the green of her vase complemented by the apple, and the rose providing a stark contrast of livingness and colour to the dried line of the branch. Zaitoon cleverly worked with an empty coconut shell as her "kenzan", using the beautiful ixoras to celebrate the spirit of Madras. 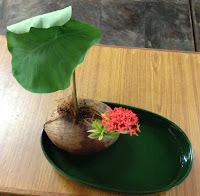 After a dialogue with the senseis she also experimented with a large surface leaf to balance the masses of the coconut and the vase. 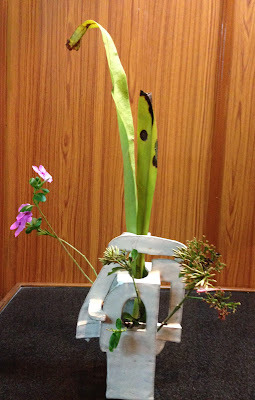 Chitra also used horizontal expression with this free style composition. 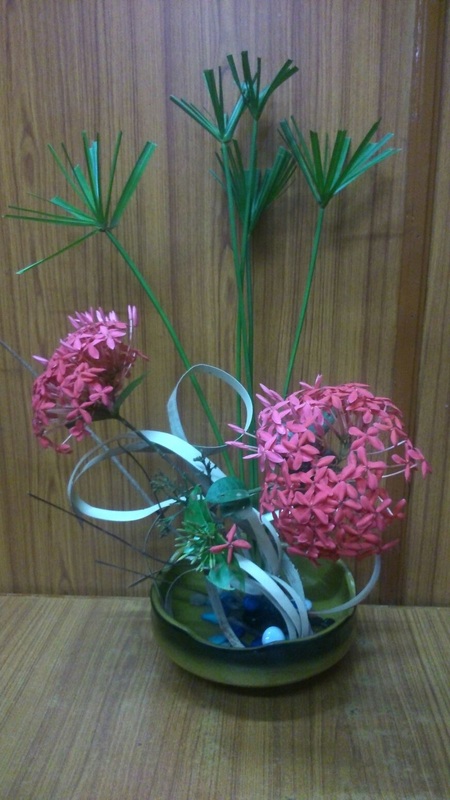 Pushkala's upright style has no kenzan, using the telephone wires imaginatively to hold the material in place, working with three different flowers, innovatively. 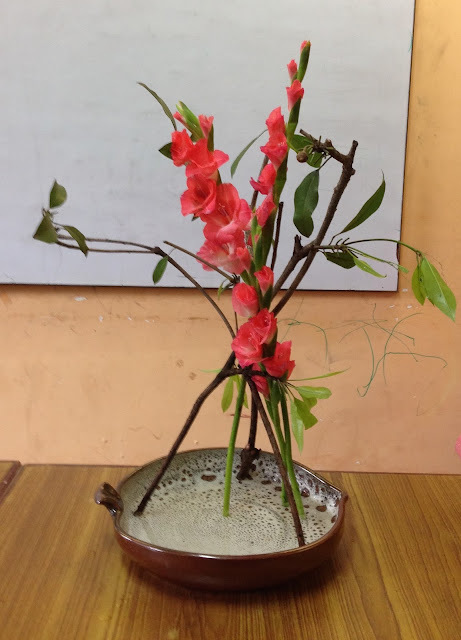 Divya Selvam's no kenzan composition was also upright, with the bougainvillea adding a dash of colour and softness to the bold umbrella plant lines. Rupa tried the open style, using pebbles. 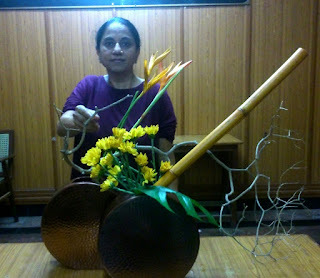 Bhuvana displayed the conventional no-kenzan method of tripod balancing. The new member Chitra also attempted a composition, using a basket with leaves in order to achieve the no kenzan effect. Meenu, Ambika, Nirmala and the new member Divya were observers this time, and did not take part in the workshop.